In the course of their interventions under the supervision of a professional in institutions or with private individuals, the assisted activities and therapy dogs promote the social, natural and beneficial links between humans and animals. They are a source of stimulation at different levels: cognitively, emotionally, socially, sensory, psychomotor ... Their work comes as a complement of traditional methods and can be considered as a non-drug approach. Dogs play a role of support for the therapist or worker in his professional activity by facilitating certain therapeutic, social or educational actions. The results of these interventions are very surprising. For example, the stimulation can be such that the elderly find again the taste for communication, smile and recover energy and mobility. Interventions assisted by animals are beneficial in more ways than one, they do not make the dog a therapist: it does not cure the person. On the other hand, it contributes to the well-being and reinforces the therapy put in place. Assisted activities and therapy dogs do not come from a particular breed and do not have common physical characteristics, as is the case for guide dogs or service dogs. They can be of all origins to the extent that they have the relational skills, a complicity with the therapist or worker and some know-how related to the activities. 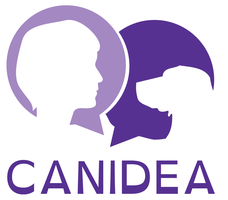 CANIDEA and its members are working to redirect puppies who do not become guide dogs or assistance dogs towards assisted activities and therapy for several reasons. Indeed, today, the majority of active assisted activities and therapy dogs have been educated by stakeholders who work with them without them having skills in dog training. This poses two kinds of problems: the dog may be stressed because the orders he receives are inappropriate and he may engage in risky behavior because he has not been educated properly. Reoriented dogs are psychologically stable dogs with proven interpersonal skills: they received several months of education and were selected because they will be comfortable in assisted and therapy activities. Thus the well-being of the animal is fully considered and the workers will be able to work safely. In addition, different qualities are required for guidance, assistance (depending on specialty, deaf and diabetic do not have the same needs for example) assisted activities and therapy. However, dogs that are unsuited for guidance or disability assistance can be excellent assisted activities and therapy dogs when their qualities are related to another specialty. In addition, it is relevant to promote the reorientation of dogs who do not fulfill the requirements for guidance or disability assistance, especially since these dogs seek human contact. These dogs who have received several months of education (with a significant financial and human cost) will be able to mobilize their relational skills in assisted and therapy activities.